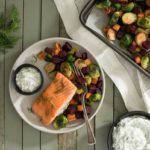 Load up on your veggies with this delicious roasted trout dish that’s served with a herbed yogurt sauce – perfect for dinner on a winter’s night. Roasted Vegetables: Preheat oven to 425˚F (220˚C). Toss together sweet potatoes, Brussels sprouts, 2 tbsp (30 mL) olive oil, and half of the salt and pepper; arrange on large parchment paper–lined baking sheet. Toss together beets, remaining oil, salt and pepper; add to baking sheet. Bake, turning every 15 minutes, for 35 to 40 minutes or until tender. Roasted Trout: Meanwhile, place trout fillets, skin-side down, on parchment paper–lined baking sheet. Whisk together oil, mustard, garlic, salt and pepper; brush evenly over trout. Bake for 10 to 12 minutes or until fish starts to flake. Herbed Yogurt: Whisk together yogurt, green onion, parsley, 4 tsp (20 mL) dill, garlic, salt and pepper. Divide roasted vegetables among 4 plates. Top each with trout fillet and dollops of Herbed Yogurt. Sprinkle with remaining dill. Substitute Arctic Char or salmon for trout if desired.